Cement tiles are handmade. It’s an amazing process that is extremely labor intensive and one that takes time. A manufactured tile can’t provide the same natural variation like the hand of a tile artisan. 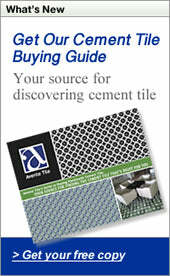 That is why prices for handmade cement tile start at $9/SF for plain unpolished tile in an 8"x8" format. Patterned tile generally start at about $12/SF to $15/SF and can reach $20/SF for 8"x8" tiles. If you've got some flexibility with your design and color choices, then here’s five ways to get more cement tile for less. Use existing patterns in standard colorways. Use existing patterns in standard colorways or in-stock tiles.Cement tile offers the creative homeowner, designer or architect the ability to create custom patterns in specific colorways. This benefit comes at a cost because new molds, custom colors, virtual designs and strike-off samples are required to create the tiles and confirm the look prior to a full-order. Leverage your buying dollar by working with existing patterns and colorways, or choose from in-stock tiles. You’ll still get a great looking installation; but, you’ll avoid the time and costs of customization. Cuban Tiles, like those shown here, are stocked. Use only plain tiles or solid color tiles that don't have a pattern. Cement tiles in single colors make great flooring designs while providing a rustic fluidity because of the inherit variation in color. For a bold look, you can also use contrasting alternating colors to create a checkerboard pattern. Or, choose plain tiles in two or three colors to create a rug design for a room. Consider using a different format for the rug border. For instance, use black 8”x8” tiles for a rug in the center of the room, frame the rug with 4”x8” grey tiles, and fill the area outside the border with 8”x8” white tiles. Limit the use of patterned tile. Minimize the quantity of patterned tile required and you can save a bundle - especially on large flooring projects. A tile with a complex pattern or a lot of colors takes longer to make and will have a higher rejection rate. Here's a few great ways to enjoy these tiles and still meet your budget. Make a rug with plain tiles framed in a patterned border tile. Framing a solid color field tile with a decorative border is a great way to use cement tiles. This keeps the design simple but not overpowering. You should consider using plain cement tiles or solid color tiles if you are timid about using the colorful stylistic designs found in many cement tile patterns. Framing plain cement tile with a decorative border is a great way to use cement tiles. 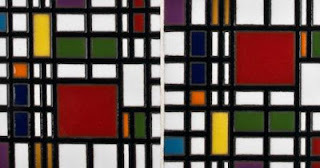 Or, create medallions or groupings of four patterned tiles separated by a "grid" or row of solid color tiles. You can reduce the tile cost by 25- to 75-percent when compared to a floor that uses all patterned tiles. Patterned cement tile can be grouped into medallions and separated by a "grid" or row of plain cement tiles. Use the largest format or size available to save both manufacturing and installation costs. Generally speaking, a large tile size or format will be much less expensive to manufacture and install than a smaller size format. This is a great choice when using plain cement tiles because you save costs by simply choosing a larger format. We can provide cement tiles up to 14”x14”. You can save 40% by using 12”x12” tiles instead of 4”x4” tiles. Avoid dark blue & green colors. If you can, avoid dark blue and green colors in your pattern or plain cement tiles. Cement tiles are colored with natural pigments. Red, brown and yellow are generally created by adding iron and iron oxide compounds that are abundant and inexpensive. Dark green and blue colors are created with cobalt compounds. Cobalt is the reason these colors will cost more. The saturated blue and deep green colors can add 20% to the cost of the tile. The deep, saturated indigo and sky blue in this tile makes it beautiful and more expensive. These tips are guaranteed to reduce the costs per square foot of any cement tile project. If you are flexible with your design and colors, these tips will allow you to get more cement tile bang for your buck! Tell us what you think. Would you consider implementing any of these tips on your cement tile project? Do you have a money-saving tip you’d like to share? Or, do you have a question about cement tile that you’d like answered – share it here! It’s been an exciting year so far at Avente Tile. We have worked on several commercial projects, a historic renovation, and shipped lots of samples. Thank you to our many customers who have picked some unique tiles and been patient with us. I always like to share photos of the samples. It provides customers with a better idea of what the cement tiles look like right out of the box. Furthermore, it helps show the tile in a different light compared to the product catalog images. Here's some of the sample cement tiles and colors that we have shipped so far. You'll remember this tile from last month's blog post. Mark and Erin C. from central New York showed us how Finding the Right Cement Tile Adds a Personalized Touch to their kitchen. Here's some photos of sample stock before we shipped it to a customer. I love the simple elegance in this pattern and the bright, warm yellow border. Wouldn't it be great for a sunny breakfast patio? Traditional Santurce Cement Tile 8" x 8"
I love these muted colors in the bold print. What I find extraordinary with this pattern is the way the cement tile appears to be layered. This unique series of cement tiles is created by artists from the Dominican Republic. It showcases their skills, while elevating cement tile to a functional art form. A portion of each sale supports charities that promote art in the artists' home country. 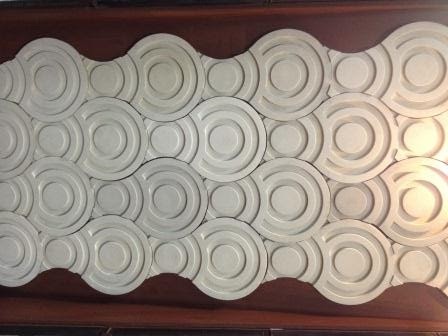 Traditional Joery Santos Cement Tile 8" x 8"
What do you think of these patterns? Would you considering using any of these cement tile patterns in your home? Let us know what you are thinking. This month's project pick includes a tile pattern whose name conjures both a romantic and exotic locale and the setting for a 1942 American romantic film classic, Casablanca. A perfect choice for Valentine's Day! The patterned cement tile, Casablanca, in this bedroom takes its cues from the Moroccan tradition of zellij tile design. The bright jewel tones, especially the blue, and small, intricate geometric lattice pattern, are details found in zellij tile and the inspiration for this pattern. The Casablanca rug pattern is available in the standard 8" square format with a less-common 4"x8" border and 4"x4" corner to create a classic rug design. Zellij is the art of hand-cut geometric mosaic design. Both decorative and elegant, zellij tile is noted for its rich colors and pattern. It is one of the highest forms of artistic expression in Moroccan culture and the Islamic world. Its repetitive mathematical patterns carry artistic, religious and scientific meaning. The saturated blue, bright yellows, and deep greens in the Heritage Color Palette are great choices for emulating Moroccan zellij tile colors. The zellij tile shown here has cobalt blue, emerald green and bright yellow - colors that became popular in the 17th with zellij mosaics. The colors used in The Casablanca pattern are listed below. You can use this colorway or easily customize the colors shown in the pattern below with any Heritage Color. Because they are hand-crafted, plain cement tiles in a single, solid color have a slight variation in shade that adds subtle sophistication. The plain cement tiles around the rug are often referred to as "fill tile" because they are used to fill the area around the border and rug. To make a room "pop," consider a bright, bold color like the blue used in this design. In this case, the blue is also thematic; it represents the gem tones one might find in a zellij mosaic. And, if you decide to create a cement tile rug, start with a scaled drawing and by reading our Tips for a Creating a Great Cement Tile Rug Design. Saint Valentine's Day, now known as Valentine's Day, is observed on February 14 each year in many countries around the world. The liturgical celebration was named after an early Christian saint named Valentinus. The story goes that Saint Valentine was imprisoned for performing weddings for soldiers who were forbidden to marry, and for ministering to Christians who were persecuted under the Roman Empire. It was during his imprisonment that Saint Valentine healed the daughter of his jailer, Asterius. According to legend, before St. Valentine was executed, he had written "from your Valentine" as a farewell to the jailer's daughter. Forward now several centuries later where Saint Valentine s became associated with romantic love thanks to author and poet Geoffrey Chaucer (late 1300s). By the 15th century, Saint Valentine's Day had evolved into an occasion where lovers expressed their love for each other by presenting flowers, offering candies/chocolates, and sending greeting cards (known as "Valentines"). Today, the symbols of Valentine's Day are represented by heart-shaped outlines, doves, the color red, and of course our favorite cherub, Cupid. In honor of Valentine's Day, we've selected a sampling of ceramic and cement tiles that would fit in perfectly with your current or upcoming projects! This month we're featuring "Bird of My Heart" as a sweetheart deal for tile lovers. Save 10% on "Bird of My Heart" through February 28. Created by an artisan that isn't afraid to use a bright, beautiful palette in her glazes and themes inspired from nature. Get acquainted with the complete line of Eartha tiles! 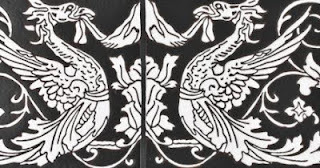 They all boast of rich colors completed with intricate relief designs. Eartha tiles are great gift ideas and your sweetheart will be sure to remember your artistic thoughtfulness! Remember, these tiles are handmade, one-at-a-time. No two are exactly alike. To receive 10% off, call us at 888.739.4972 and mention the Valentine's special! 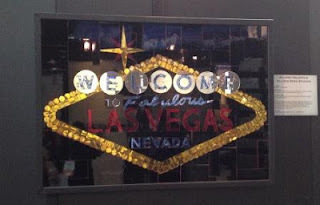 Surfaces, the largest U.S. event serving the floor covering industry, once again brought together buyers and sellers from around the world to see the latest floor covering products, tools, services and technologies. The event, held January 28-31 in Las Vegas at the Mandalay Bay Convention Center, was co-located with StonExpo/Marmomacc Americas. Thousands of floor covering retailers, distributors, installers, architects, designers and builders from around the world convened on the show floor to see the latest product offerings from more than 600 exhibitors in various categories, including tile and stone, while gaining vital education, and most importantly, networking with other floor covering professionals. Here’s a glimpse of what new tile and stone products enjoyed the most visibility by the show’s visitors. Also catching my eye was a new collection by Mediterranea called “Juliet’s Courtyard,” named after the Shakespearean lovers of Verona, Romeo and Juliet. The collection features a rich assortment of stones of various sizes and colors – all perfectly designed to blend together into a timeless look. Inspired by the classic treasured travertine tones and colors of Tuscany, the Juliet’s Courtyard collection utilizes Dynamic HD Imaging™ technology to create a stunningly vintage look in a product manufactured to the highest technical specifications. The collection is available in two colors – “Juliet’s Blend” – a perfect mixture of light soothing earth tones and natural hues – and “Romeo’s Blend” – a rich and bold fusion of darker tones with traces of gold and rust shading. Juliet’s Courtyard is unique in that it utilizes four fully modular sizes – 12”x24”, 12”x12”, 18”x18” and 6”x6”. This allows the individual tiles to be installed in an array of patterns and combinations – giving designers limitless possibilities when crafting flooring concepts worthy of Shakespeare’s literary masterpiece. 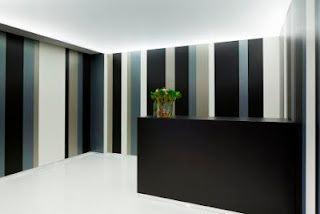 Crossville Inc.’s Laminam collection gained a new series with the addition of Filo, a uniquely textured, metallic-finish line of large format porcelain panels ideal for skinning interior vertical surfaces in commercial settings. Filo comes in eight colors – Brina, Mercurio, Pece, Rame, Oro, Argento, Ghisa and Bronzo – each featuring metallic effects and a texturized surface that adds dimension and subtle sparkle. The overall look is modern and glamorous—ideal for use in hotels, restaurants, spas, salons, retail and other contract design environments. Crossville's latest addition to its Laminam collection, Filo. Dimensions of all Laminam by Crossville panel sizes are 1m x 3m (nominal size 3’4”x10’) with 3mm thickness. The generous outer dimensions coupled with the extremely lean profile make these panels versatile for an array of uses and light enough for ease of installation. The durable porcelain body reinforced with a fiberglass mesh backing creates a surface skin that can be installed over most structurally sound substrates, including existing tile or painted walls. Finally, in celebration of the 10th year of its SpectraLock Grout product, Laticrete conducted an in-booth promotion where the works of extremely talented mosaic artists were displayed. The mosaic art gallery featured unique, museum-quality creations using Laticrete’s SpectraLock Grout Dazzle. The epoxy grout features a unique design component that adds metallic and "glow-in-the-dark" enhancements to the SpectraLock product. “Dazzle was used in all of these creations," said Ryan Blair, Laticrete Channel Manager. "We’ve also unveiled several new Dazzle colors here at Surfaces, as well." Laticrete’s Las Vegas sign combines SpectraLock Grout Dazzle with mosaic tile artistry. Lastly, you can chalk one more item to the good news column. Surfaces | StonExpo/Marmomacc Americas will be co-located with International Builders’ Show (IBS) and Kitchen & Bath Industry Show (KBIS) in 2015! According to my informal poll on the show floor, all responses indicated an overwhelmingly positive outlook for the 2015 event. What do you think of this one-stop show? Do you think it will help overall attendance for all the co-located shows? Will it be information and product overload? I would love to hear your comments!